Today I put my new Rigid Contractors table saw to work. In the past I used a small Skill table that was very wobbly and low in horse power. WOW what a difference. I cannot emphasize enough how nice it is to use the right tool for a job compared to the difficulty of trying to use a sub par product or tool. In the past I had to fight with the table by adding weight to the arbor in an attempt to get it to act like a heavy, steady contractors saw. The board would lift, sway and float away from the blade at every opportunity causing blade marks and uneven cutting. The saw motor would bog down with the demands of ripping the long board, slowing down and hacking at the board instead of making powerful clean cuts. 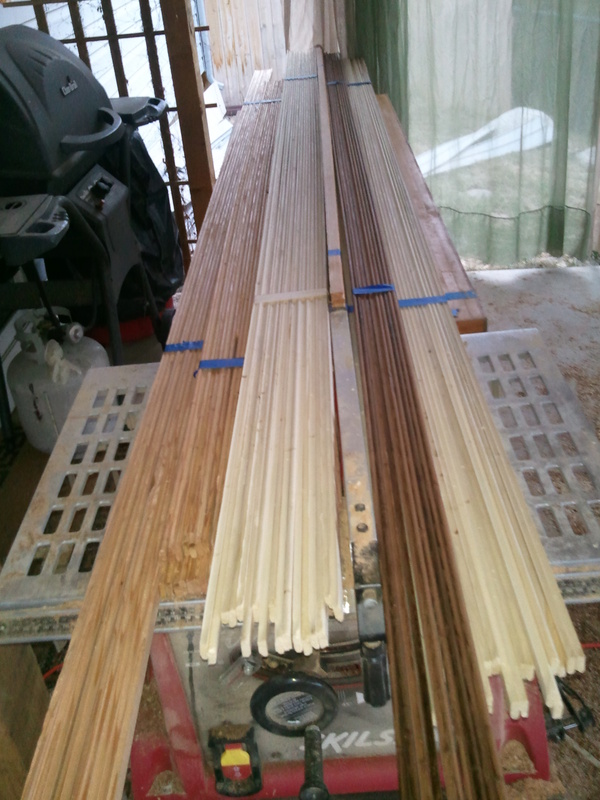 What a pain it was to produce the strips I must have to build a boat. I want great wood not good wood, not ok strips but the best color, grain and shaping I can get. Why build a boat, taking hundreds of hours to see to completion with poor quality or badly milled strips. Start with the best and I will get the best out of my efforts. I am talking to myself but you can take this to heart, I’m sure it applies to all but I did not want to do listen, until now. So I purchased a used Ridged table saw. Its and older model built in the USA. It has a 1hp motor which may be a little small for some people but it rips through a 2 inch cedar plank without a hitch. It is heavy, having a cast iron table and a good solid arbor. It does have castors on it to allow it to be moved easily around my shop. I used a piece of ¼” ply to make a zero clearance insert to keep strips from binding in the opening around the blade and another piece of ply to enclose the bottom of the arbor so I could use a shop vac to collect dust. To make a zero tolerance insert, remove the insert provided by the manufacturer of the saw and use it as a template to draw the outline of a new one on a piece of thin plywood. Cut the new insert out and install it into the saw without cutting out a hole for the blade of the table saw. Once your new insert is properly fitted into the saw, slowly raise the blade, cutting a hole into the insert resulting in a zero clearance insert. I utilized my 16 foot long strongback as a discharge table to catch my 12-16 ft long boards as they came out of the table saw. In front of the saw I used a single roller stand to support the weight of the board until it was caught by the table saw. The transitions from the support structures to the table were closely aligned to eliminate transitional movement of the board. Meaning, when the board leaves the roller stand or enters the discharge catch table it does not have to settle or lift into a new position. It just moves smoothly along the length of the feed support, cutting table and onto the catch table. This is an important process to milling strips without causing a defect somewhere along its length that will cause a quality issue with the strips. A nice milled strip with a small blade mark in the middle can result in an unusable strip. Or maybe all your 16 ft strips now have a defect in the middle that results in cutting all your strips to 8 foot lengths. Not the end of the world but It may result in problems for your project and the typically high standard boat builders have. 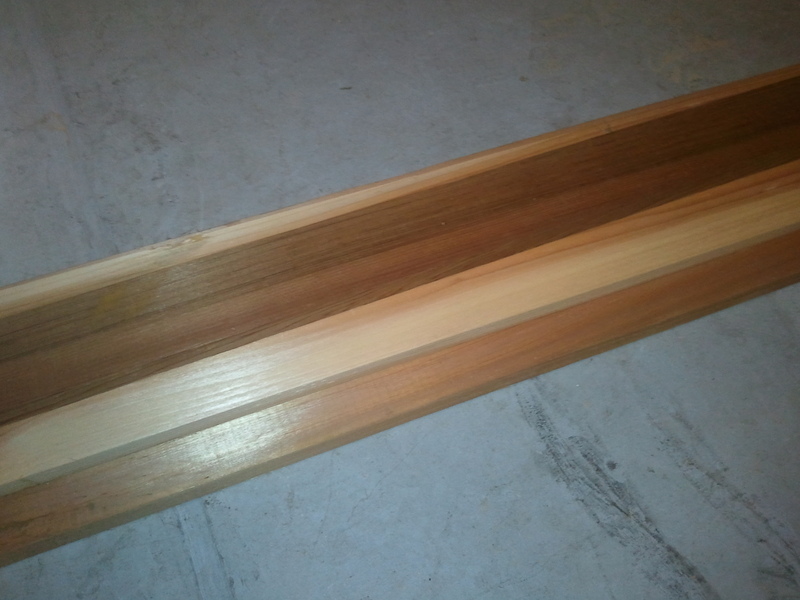 I processed my boards running them through the saw, producing 1.5” x 3/16” strips of cedar. I then ran them through the saw a second time by lying them flat and introducing a 3 degree bevel. This resulted in strips that are 3/4 ” x 3/16 “ and pre-beveled. I do not intend to use bead and cove in the future if this works out. 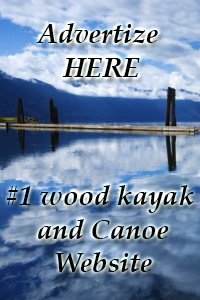 This entry was tagged cedar strip, kayak, milling strips, wood strip. Bookmark the permalink.